Nobel Panel Decides Against U.S. HIV Discovery The 2008 Nobel Prize for physiology or medicine went in part to two French researchers for discovering the virus that causes AIDS. The award was not shared by American Robert Gallo, who has also claimed a role in the discovery of HIV. Additionally, a German scientist got the prize for establishing the cause of most cervical cancers. 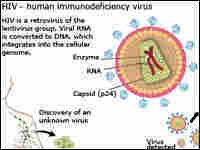 See diagrams showing the inner workings of the HIV and HPV viruses. This year's Nobel Prize for physiology or medicine recognizes two landmarks in the history of viral diseases. Two French researchers won for discovering the virus that causes AIDS. And a German scientist got the prize for showing that human papilloma viruses cause most cases of cervical cancer. The scientists will split the $1.4 million prize. This year's medical Nobel ends decades of speculation about who would win the everlasting credit for discovering HIV — the deadliest virus of our time. The surprise is not that French researchers Francoise Barre-Sinoussi and Luc Montagnier won the Nobel, but that American Robert Gallo did not share in it. Throughout most of the 1980s, the American and French researchers fought bitterly over who deserved the credit. Eventually, President Ronald Reagan and French Prime Minister Jacques Chirac signed a declaration that they were co-discoverers. Today Gallo directs the Institute for Human Virology at the University of Maryland. Its Web site identifies him as the co-discoverer of HIV. But the Nobel committee said no, the French got there first. Dr. Anthony Fauci of the National Institutes of Health said that's the way the scientific cookie crumbles. "When the Nobel committee looks at it, they look and they say, 'First observation, 1983.' Boom, that's it," Fauci said. "I respect that. It's just too bad, because Bob's contribution was very important. But there's a limited number of people that can get the prize." The rules say only three people can share a Nobel. And the Nobel committee chose to split the award this year between the HIV and papilloma virus discoveries rather than include Gallo in a singular HIV prize. Fauci says that while the French were first to isolate the virus, Gallo did a lot of the work that proved it causes AIDS. "The actual intellectual link between the virus and HIV as the cause of AIDS was really very much slam-dunk in the series of papers in 1984 by Gallo's group" in the journal Science, Fauci said. Today, Gallo told a reporter he was disappointed. Montagnier, who is in Africa, said his old rival deserved to share the prize. But San Francisco researcher Jay Levy — the third scientist to publish the discovery of AIDS — was content. "In the end, what they did was quite, quite fair," Levy said. "And I congratulate them." No such questions hover over this year's other medical Nobel laureate, German scientist Harald zur Hausen. He's worked since 1970 to convince skeptics that human papilloma viruses cause cervical cancer. Bennett Jenson, a scientific colleague at the University of Louisville, says zur Hausen has been in the running for a Nobel for a long time. "He's the founding father, and we would have been sorely upset if he hadn't been the Nobel Prize laureate for medicine this year," Jenson said. Fauci says zur Hausen was way ahead of his time. It's been 24 years since he first tried to persuade drug companies to develop a vaccine against cervical cancer. Two years ago, the first such vaccine won approval. Zur Hausen wasn't available Monday. But Jensen says his friend hopes the $350 cost of the vaccine can be brought way down so millions of women around the world can avoid cervical cancer.